At 35 years old, Bonnie Palmer was diagnosed with brain cancer. Here’s how she’s navigating the journey so far. In September 2016 I was diagnosed with an Anaplastic Astrocytoma brain tumour, a rare and high grade brain tumour. Thankfully it was discovered in time to give me some treatment options. So far I’ve undergone surgery, radiotherapy and chemotherapy and they all appear to be working. Someone asked me recently how I’m coping and it got me thinking … how am I getting through this? Initially I was in a state of deep shock. I was so caught up in the physical aspects of having a new disease (tests, procedures and medication) that I didn’t have the mental space to start dealing with the emotional aspects. Eventually I had to. When you’re sick you spend a lot of time trying not to make the people around you worry, but when I’m in a counselling session I’m free from that. I can talk about my biggest fears and struggles and I always feel so much better for it. The mind is a complex beast that can be difficult to control. Meditation is just one tool I use to keep my thoughts as positive as possible. The type that works best for me is Transcendental Meditation where you repeat a mantra silently to yourself (think Deepak Chopra). I aim for 20 minutes a few times a week. Ideally I should be doing it every day, but sometimes life just gets in the way. For me this is the only time I’m guaranteed not to let my mind wander to the ‘dark side’, because I’m too busy concentrating on getting through the pain! I see a personal trainer twice a week and we focus on strength and interval training. Feeling strong is more important to me now than being skinny. I also aim for two to three days of cardio a week – however, as with the meditation, I don’t beat myself up if I don’t reach that target. Exercise is amazing for stress and sleep and they’re things I need to manage constantly. It just so happens that writing is what I do for a living, but that in no way makes me more qualified to write about what I’m going through than anyone else. There can be no one more qualified to write about you than you! While it’s a deeply personal experience and at times I’ve felt a little exposed, it has also been incredibly cathartic and rewarding. Once I started to feel better physically, I wanted to get back to work. I’ve always been a hard worker – I don’t say that to blow my own trumpet – it’s just something that comes naturally and that I truly enjoy. I guess it helps that I get paid to do what I love. 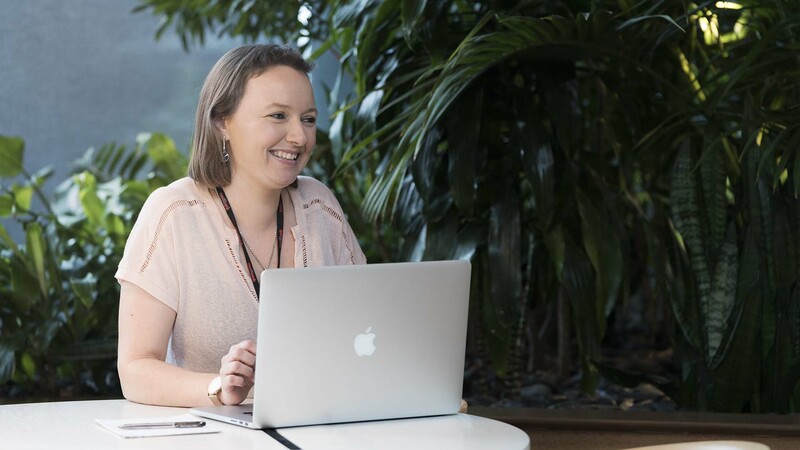 I was working for Medibank when I was diagnosed and after seven months off, I recently returned on a part-time basis. It’s the best thing I could have done. Becoming part of an awesome team of people, some of whom I already knew and some I’m getting to know, feels great. There was a part of me that was scared I wouldn’t be able to write like I used to, but coming back to work has shown me that nothing has changed there. I have more of a routine and a focus and that is always a good thing. Who knows what the future holds. There are many people who live with my type of tumour for years, even decades. From the beginning, my oncologists have told me that my age and overall good health give me a great chance of being one of these people. So that’s the plan I’m working to.